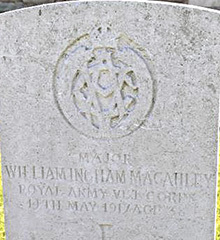 William Ingham Macauley was the only son of Christopher James and Margaret Macauley. William was born in Belfast about 1879. William was a pupil at the Royal School Dungannon between 1894 and 1896. He graduated from the London Veterinary College on 16th December 1905. William entered the Army Veterinary Corps. He had served in Egypt, India and Burma before the war commenced. In August 1914 he went was attached to the 2nd Dragoon Guards (the Queen’s Bays). 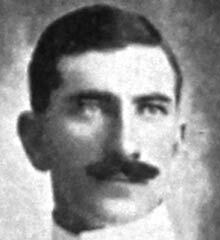 In February 1916 he was appointed Assistant Director of Veterinary Services and was promoted to the rank of Major. He was again mentioned in dispatches on 2nd January 1917. Tragically, on 14th May 1917, his body was found with a single gunshot wound, believed to be self-inflicted, a few miles behind British lines.